Watch the ‘How to Install Video‘. This will show you how you can easily cut and install Storm Stoppers with a carpet knife and straight edge, no power tools needed. Watch the ‘How to Measure‘ video (right) and measure all your doors and windows. not possible to give you a price. Fill out the DIY Quote Form below with your name, address, city, state, zip and the best phone number to reach you at for any questions regarding your DIY Quote Request. Fill in the name of each window or door opening (i.e. “Kitchen” or “Living Room” etc), the width and length of all the window or door openings you wish to protect. To save space, the form below allows you to input 5 windows at a time. To add more, click the “YES I WANT TO ADD MORE” button after the 5th window submission, and another 5 input spaces will show up. After you have completed the form, please click the “submit” button and your window and door measurements will be emailed to us. A copy will also be emailed to you. We will email you your itemized Storm Stoppers DIY Quote and cutting diagram within 48 hours or sooner. A Storm Stoppers sample will also be mailed to you. Storm stoppers are in stock at our Orlando, Wilmington, Myrtle Beach and Kauai warehouses. Estimated delivery time is within 10 days of order confirmation or sooner. If you cannot submit this form for any reason, please download the form here, print and complete and fax to us at (407) 423-1107.
local county tax, which varies from 6% to 7%. If you have questions about a particular window or door opening, please take a picture of it and text to 407-719-6988, cell. Please include your name and city so we can reply back. Need to enter more windows? List additional windows here. Put window name with width x height (ie. 36 x 22.25) Do not put in the inch hash mark (“) after each measurement. You’ve got questions? We’ve got answers. Of course, if the following commonly asked questions do not answer your specific question, please give us a call. 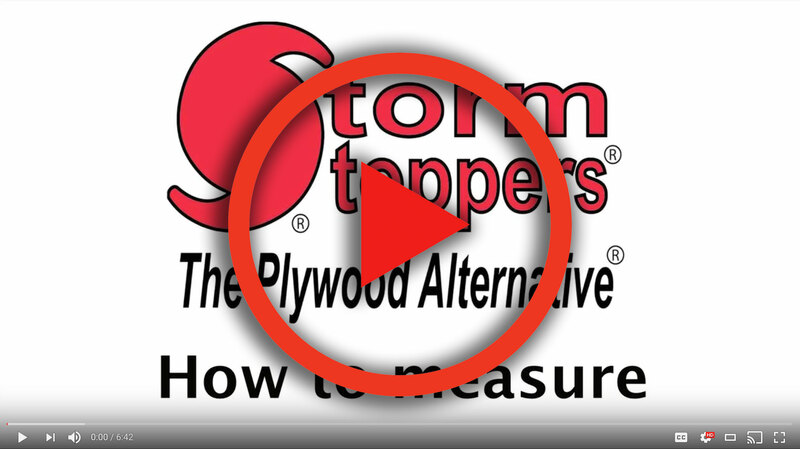 Storm Stoppers are the Plywood Alternative for storm window protection for your home! Storm Stoppers lightweight hurricane panels install without screws for easy installation and removal. Our ASTM E 1886 and ASTM E 1996 are 143MPH Wall of Wind-tested Hurricane Window Protection storm panels that let in lots of light and are the only safe hurricane shutter alternative available! For more information, visit the about page. Storm Stoppers panels are custom fit over your windows and doors. For more information about how we work, visit the about page. The cost varies depending on your particular needs. We encourage you to get a free, no obligation quote using the form above. CAN I GET A SAMPLE OF THE PRODUCT? Of course, you can! Use this form to get a free sample. DO CUSTOMERS LOVE STORM STOPPERS? They sure do! But don’t take our word for it! Visit our customer testimonials page to see what our customers have to say about us! DO I NEED TO DRILL HOLES IN MY HOUSE? Nope! One of the things that makes Storm Stoppers super home-friendly is that you don’t need to drill any holes! For more information about Storm Stoppers, visit the about page. More of the hands-on type? We get that and we’ve got you covered. Sometimes seeing is believing. Whether you’re a skeptic or just want to get your hands on that corrugated plastic, we are happy to oblige.